Queen Ehlana and the Pandion Knight Sir Sparhawk are maried, their kingdom peaceful at last, their union bledded with a very special daughter named Danae. But soon trouble sweeps westward from the Tamul Empire to disrupt not only the living of Eosia but the dead: horrific armies are being raised from the dust of the long-past Age of Heroes, threatening the peace won at such cost in Zemoch. 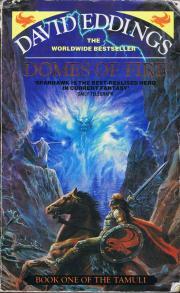 Prince Sparhawk is called upon to help the Tamuli nations defeat these ancient horrors. Perhaps the Troll-Gods are once more loose in the world! With Ehlana ad a retinue of Pandion Knights, Sparhawk will make the hazardous journey to the Tamuli Empire, aided by Aphrael the child Goddess... only to discover in fire-domed Matherion, the incandescent Tamuli capotal, that the enemy is already within its gates. 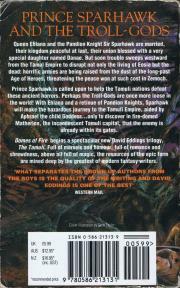 Domes of Fire begins a spectacular new David Eddings trilogy, The Tamuli. Full if marvels and humour, full of romance and shrewdness, above all full of magic, the resources of the epic form are mind deep by the greatest of modern fantasy writers.